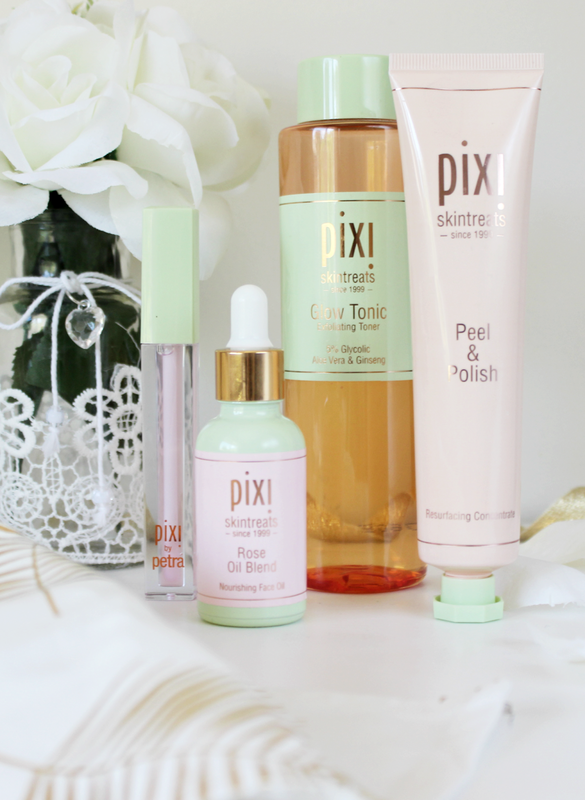 Of course, I couldn’t go through a post about Pixi products without mentioning the Pixi Glow Tonic*! This was the first ever product I tried from the brand back in the day and I loved it after first use. It leaves my skin feeling tingly clean and fresh, boosting my complexion with an overall glow. I usually complete this step between cleanser and serum in my nighttime skincare routine, or between cleanser and moisturiser in my morning routine. 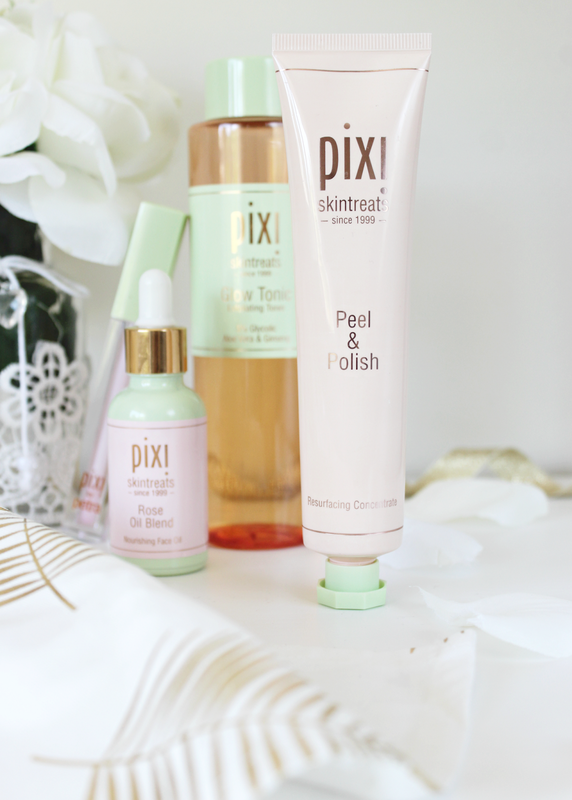 The Pixi Peel & Polish* is something I’ve had for a while but I only really ‘discovered’ it a couple of months back just before the wedding. I decided to try it after looking through my skincare collection for a new facial scrub and this one is definitely ‘the one’. It has fine grains and a very creamy texture so it doesn’t scratch or strip the skin of natural oils. I love the spa-like scent, and how easy it is to use. After using this, I find my skin is super soft and radiant, perfect for following up with all the other skincare goodies I like to apply. 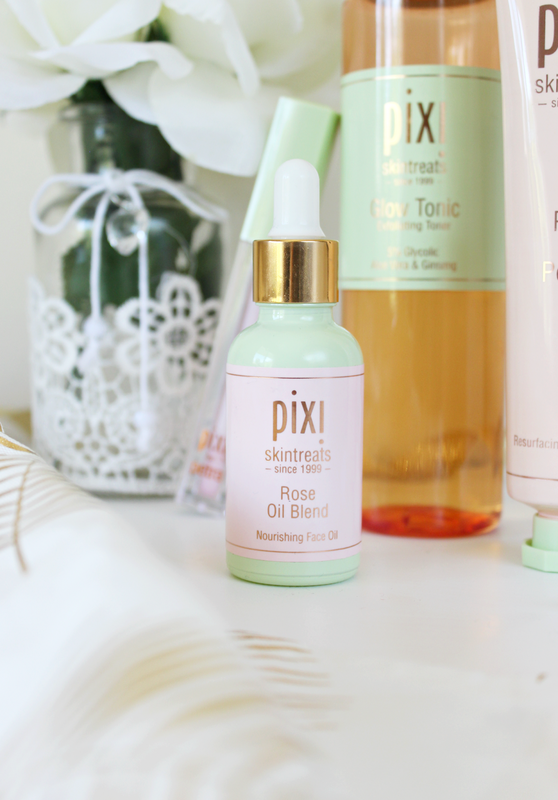 When I first tried the Pixi Nourishing Rose Facial Oil*, I was a little unsure. I usually steer clear of products containing rose because I can find the scent a little overpowering and overly floral, but this oil was surprisingly not the case. It has the subtlest hint of rose, and it’s such a lightweight, easy-to-use facial oil that really sinks into the skin. I love applying this in the morning and again under my foundation for an extra glow boost when my skin is feeling extra dry. In fact, this product is probably my favourite from the four I’m mentioning. Pixi also offers a whole line of makeup products which I’ve been trying out more recently. With summer having just passed, I found myself reaching for the Pixi Lip Lift in Petal Ice* for that glossy summer pout. The extra special touch to this lip gloss is it’s peptide infused formula which helps keep lips plump and hydrated – a bit like a fancy moisturiser for you lips. The colour is very sheer so I find I can wear this both with and without makeup. If so, what are your favourite products from the brand? Previous Post Autumn Wardrobe Wishlist. Next Post A Soft, Autumn Glow.